The radiation passes through a thin window, ionises the inert gas inside, producing an avalanche of electrons which are attracted to the central positive anode. 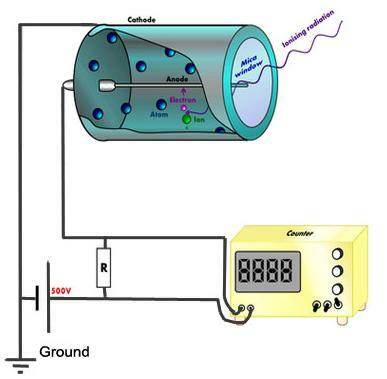 The electron current goes through a resistor and the voltage across it is a measure of the count rate. A calibrated counter records the count rate. 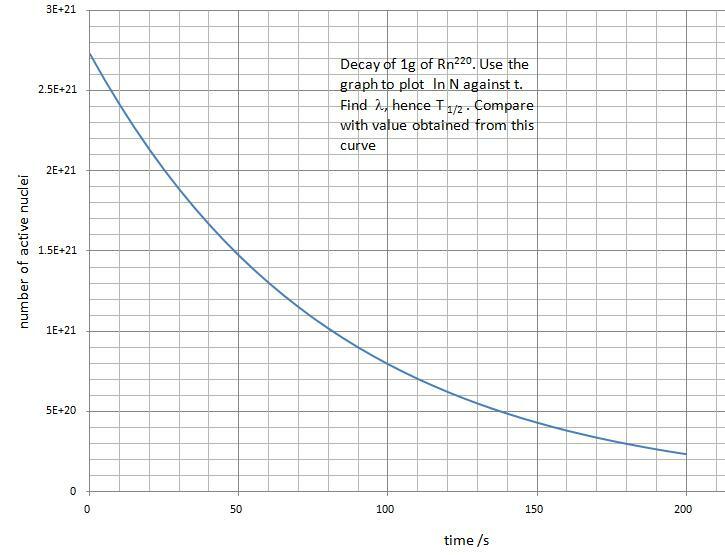 When nuclei decay, we can plot a graph to show how the number of undecayed nuclei changes with time. 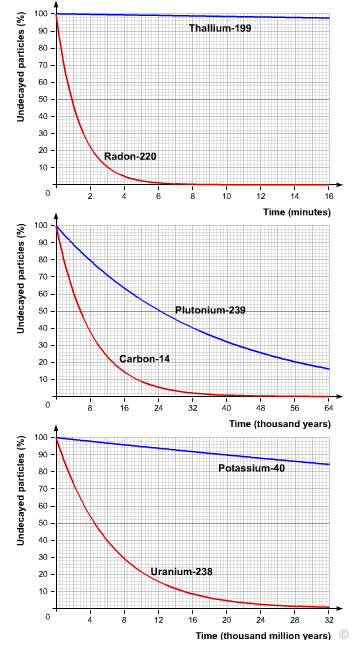 It’s very predictable, different for each isotope, but the graph is a very particular shape, called an exponential. Notice, the shapes are similar. Imagine a very infectious, fatal disease. In the first day, 100,000 people catch it and die, in the second day, 50,000, the third day 25,000. Less people die because there are less people alive to catch the disease. As time goes on, less nuclei decay because there are less available to decay. We can show this on a graph, measuring the count rate from a detector and plotting it against time. Some schools have a Thorium cow which can be ‘milked’ to measure the decay of gaseous radioactive Radon, one of its daughter products, as Radon decays by alpha decay into Polonium 216. Here’s the graph to show how Radon decays. The half life = 56 seconds. We carry on measuring for several half lives – the graph shows count rate up to about 200 seconds. Here’s a game to play. Take 100 dice. Imagine that if you throw a six the dice has ‘decayed’. Throw all the dice and take away and all the sixes. Put them on one side, count the ones that are left and throw again with the number left. Repeat several times, or until there are very few ‘undecayed’ dice left. Plot the number left against the number of goes. The graph looks just like a decay curve. We have no idea which dice will ‘decay’ but we can predict when roughly half of them have. Carbon has several isotopes. Carbon 12 is the stable variety, radioactive Carbon 14 has a half life of just under 5800 years. Any living organism takes in both radioactive and non-radioactive carbon, either through the process of photosynthesis, or by eating plants or eating animals that have eaten plants. When the animal dies, however, uptake of carbon stops. As a result, radioactive carbon atoms are not replaced as they decay, and the amount of this material decreases over time. The rate of decrease is predictable and can be described with some accuracy, increasing our ability to perhaps date the biological events of our planet. 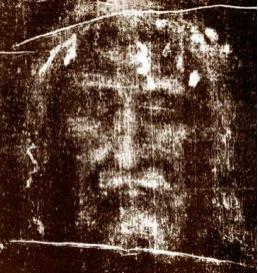 A famous experiment was done in the 1970’s to date the Turin Shroud. First century burial cloth or medieval fake? Carbon 14 is produced in the upper atmosphere when cosmic radiation from space interacts with nitrogen gas, converting nitrogen 14 to carbon 14. These carbon 14 atoms combine with oxygen to form carbon dioxide gas, which is absorbed by plants. We don’t actually know for sure if the rate of carbon dioxide formation has stayed constant over time, however, It’s usually quoted as a “small part of less than 1%” The difference casts doubt on the accuracy of the method. Henri Becquerel had already noticed that uranium bearing crystals in a locked drawer could darken wrapped photographic film and such ’emanations’ – as he called them – could turn air into an electrical conductor, it seemed. His crystals needed no energy source, they seemed to provide their own. The Curies, Marie and Pierre, who shared the Nobel Prize with Becquerel in 1903, brought fresh, original minds to the problem. They used an ore of uranium, pitchblende that produced a current 300 times larger than Becquerel’s original and reasoned that the ore must contain a new substance. They named it Polonium, after Marie’s home country of Poland and coined a new word – “radio-active”. The work was hard, gruelling and tedious, but they finally isolated another element, Radium, established the chemical properties of both and set the first standards by which the emission rate from different materials could be measured and compared. Additionally, they realised that the rate of emission decreased over time which could be calculated and predicted. 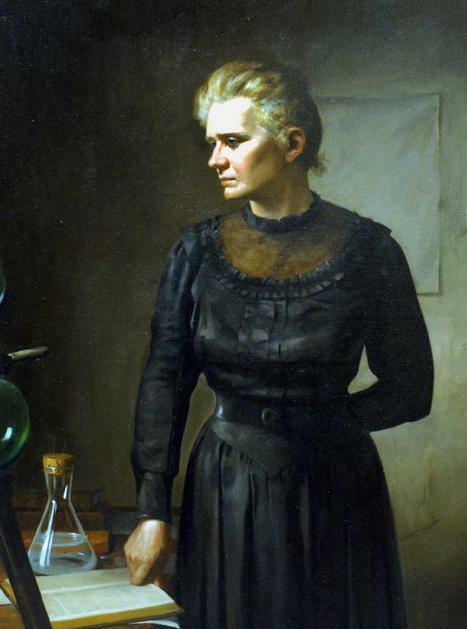 Her greatest achievement however was to realise that radioactivity was a unique atomic property of matter. All this before Rutherford established for all time the essential structure of the atom. Three types of ’emanation’ were eventually discovered. Alpha particles are helium nuclei; large, heavy and lose energy quickly. A hand or thin piece of paper stops them. Beta particles are high speed electrons that travel close to the speed of light and can penetrate a hand but not concrete. Gamma rays are emitted with either of the other two because the nucleus is left in an excited state after emission of alpha or beta. A nucleus thus has a radioactive ‘fingerprint’ which is unique to a particular isotope in terms of decay pattern and half life. The activity or the rate of decrease is predictable and can be described with accuracy, vastly increasing our ability to date the biological events of our planet. The opposite effect to the motor effect is that if a wire is moved in a magnetic field, a voltage (EMF) is produced across its ends, and if there is a complete loop, a current will flow in the loop. If the wire or magnet is moved faster, more flux lines are cut per second and a larger induced current will flow. If the wire and magnet is stationary, no current will flow. It doesn’t matter if the magnet or the wire are moved, it’s relative motion that matters. Moving a magnet into and out of a coil of wire: changing the flux linking the coil. This is a bicycle dynamo. The harder you pedalled the faster the magnet rotated inside the coil and the brighter the lights glowed on your bike. Use a stronger magnetic field. Use a coil with a larger area. 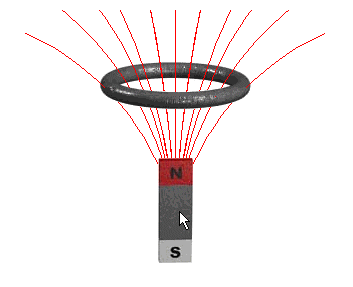 Pushing a magnet into a coil induces a current in one direction; pulling it out induces a current in the opposite direction. If the magnetic poles are swapped around, the current will flow the other way. If the magnet is stationary, or both are moving at the same speed with respect to each other, no current will flow. push the N pole upwards? 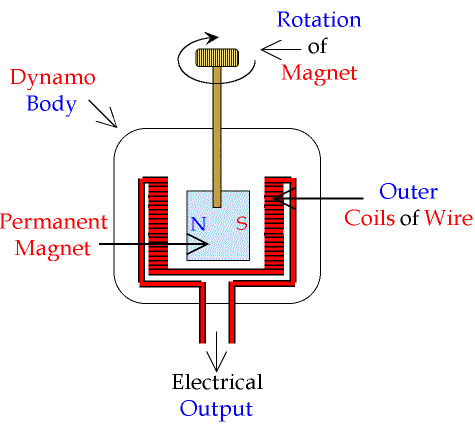 An alternating current is generated by spinning a coil of wire in a magnetic field – the generator principle. Wind more turns or loops on the coil.